Cloning a WordPress staging site is one of those necessary tasks when you’re working at a professional level in WordPress development. It is a good idea to use a workflow that includes local development, alongside online staging and production sites. 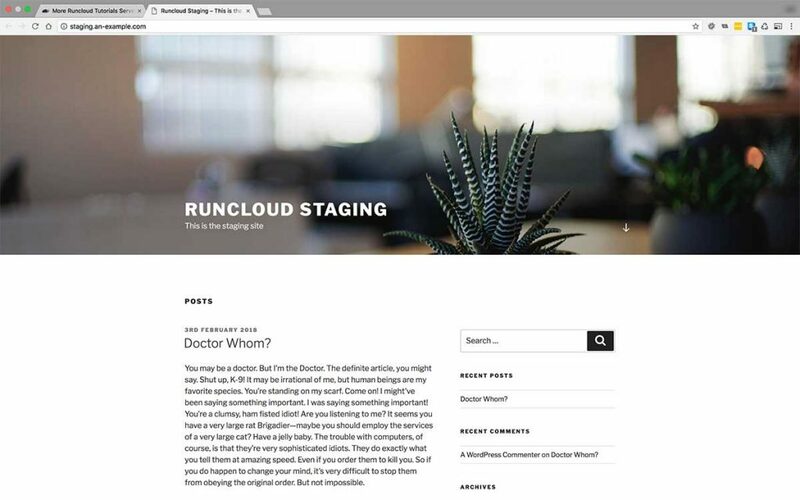 In today’s tutorial, we are going to use the RunCloud Backup System to clone a production site into a staging site. 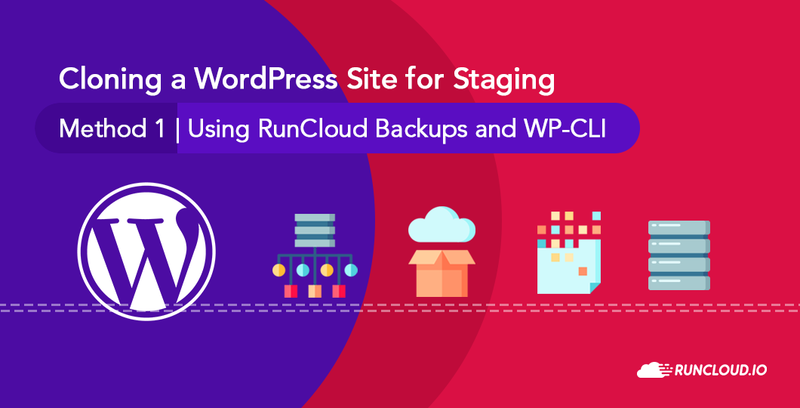 The beauty of using the backup system, is that it is incredibly easy to clone a staging site from any RunCloud managed server to any other RunCloud managed server. 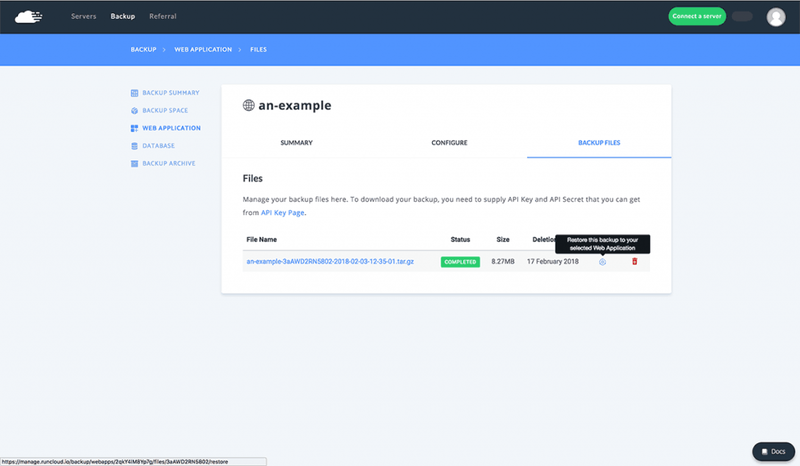 If you’ve never made a backup using RunCloud, we have an easy to follow tutorial here. It’s a very handy tool, and the cost for your backups is very reasonable indeed! To make the database changes necessary (updating the site url), we are going to use WP-CLI. Therefore, you will also need to have WP-CLI installed on your servers to complete this tutorial. If haven’t installed that yet, then not to worry, as we have another easy to follow tutorial to help install WP-CLI. I will be logging in to my servers and issuing commands as my superuser, although I won’t need to be issuing any commands with elevated sudo privileges today. 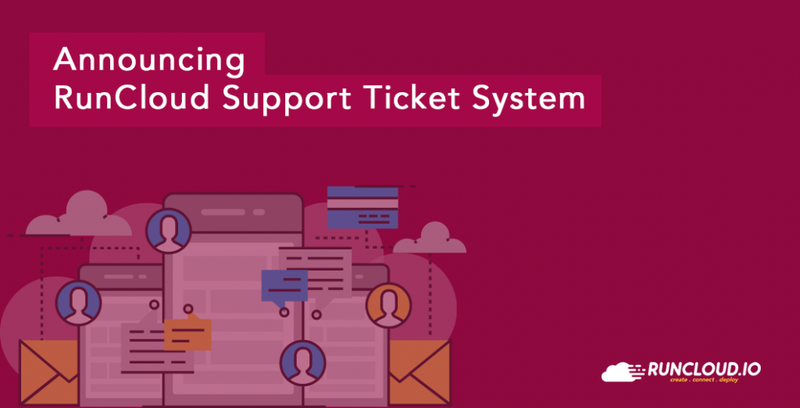 If you don’t have a superuser, but want to follow best practices you can create one easily by following this tutorial. It should be mentioned, the basic principles of this tutorial could be replicated for any other Web Application with just a few changes. 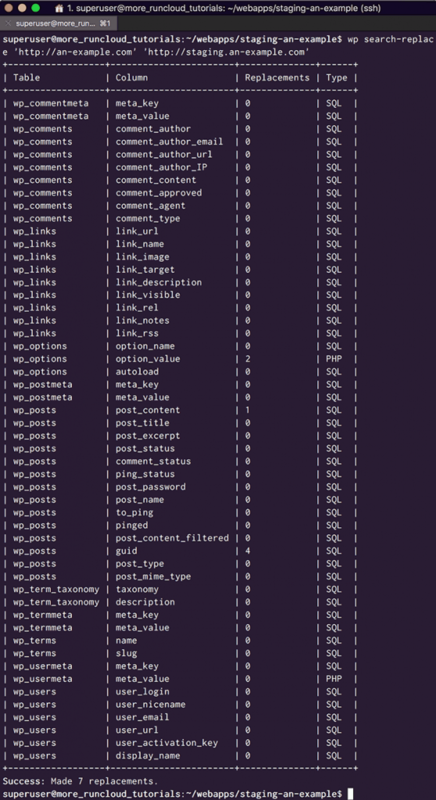 Namely, replacing the WP-CLI commands with SQL commands issued directly in the database. The principle of using RunCloud Backups remains the same. This article contains preformatted codeblocks containing code examples that can be easily cut and paste. However if you are viewing the tutorial as a Facebook Instant Article these will not be visible, due to Facebook’s policy of not supporting preformatted text. I have endeavored to include Terminal screenshots illustrating each code example for those users. I created it using the foolproof RunCloud web application creation method, more details on that can be found here. I then added just a sprinkling of dummy content. If your staging site is on the same server as the production site, then you do not need to make any DNS changes. Please just skip to the next step to Create an Empty Staging Web Application. If the staging site is on a different server to the production site, then we need to make a few DNS changes. We need to configure our Staging site subdomain DNS record to point to the IP address of the staging site server. Copy the IP address from the server that will be hosting the Staging site. 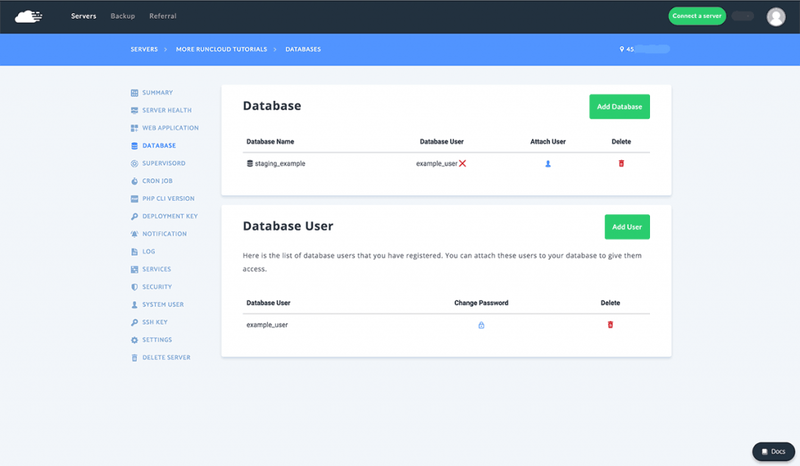 Now login to wherever you are managing your DNS records from, either your VPS provider, your domain registrar, or a third party DNS provider. Add a record for your staging subdomain. My staging subdomain is staging.an-example.com, So in my (Vultr) DNS records I added an A record, with a host name of staging and the value of my second server’s IP address. Configure your Staging Subdomains DNS records. 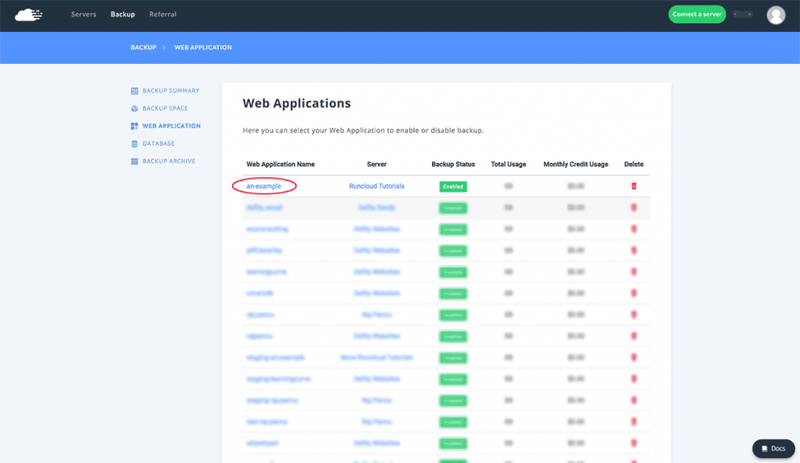 Now we will use the RunCloud Web Application manager to create the Virtual Host configuration, and web application directory structure required for the staging site. 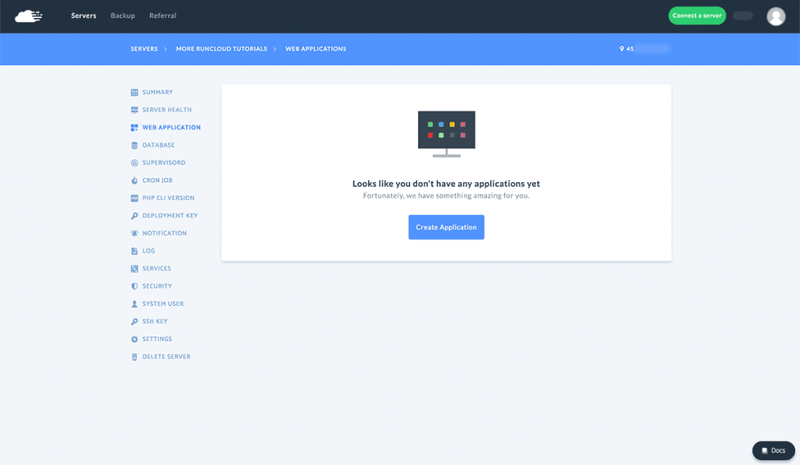 In the Web Application manager, on the server you wish to host your staging site, click ‘Create’ to add a new Web Application. 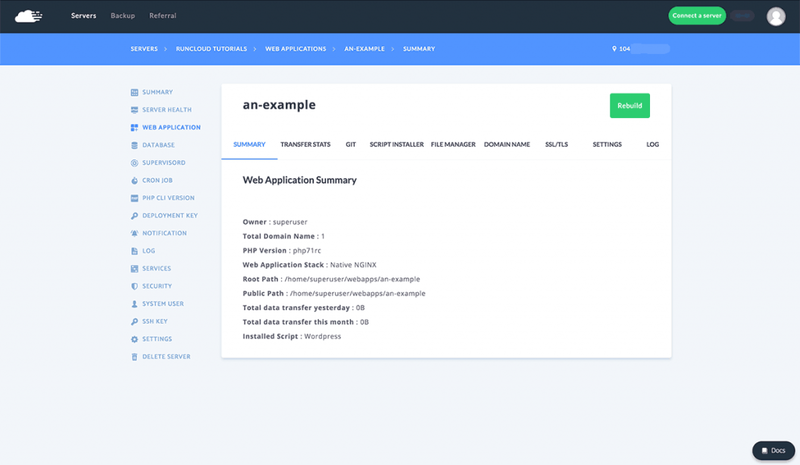 Create a Staging Web Application. For the domain name, use the subdomain that we just configured our DNS to serve. Choose your web application user, in my case that is my superuser. 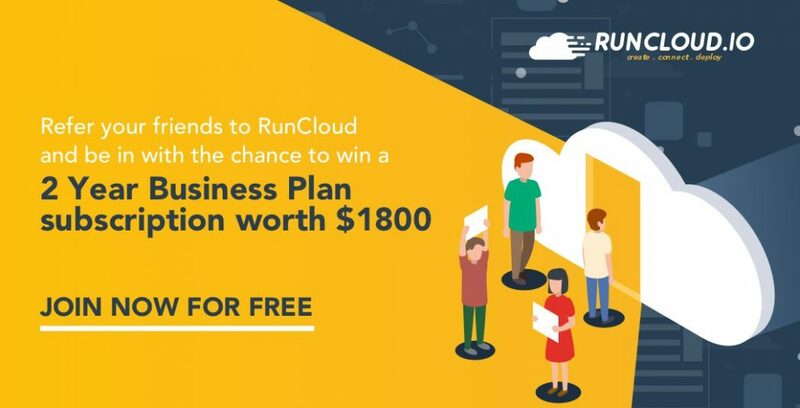 RunCloud provides you an option to install the web application in an amended path. I would stick with the path provided. Remember to substitute your chosen directory name and path correctly in the tutorial commands when necessary. 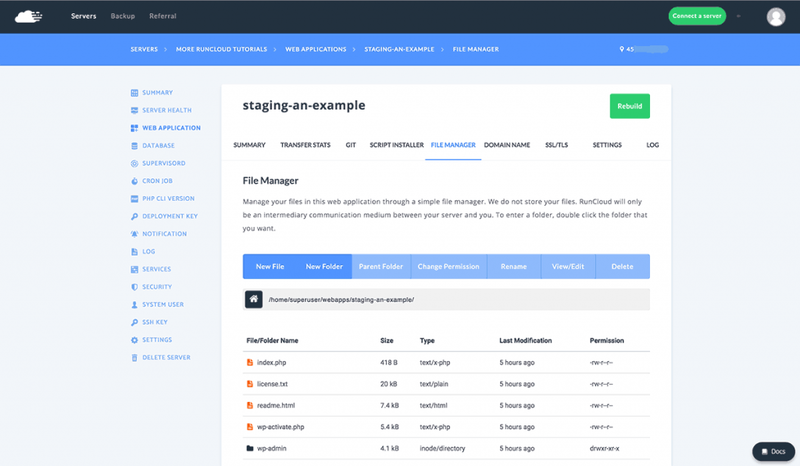 Configure your empty Staging site using the Web Application Manager. Next, go to Databases in the RunCloud dashboard. Add a database for the Staging site to use. Create a Staging Database and Database User. You will need to have an existing RunCloud Backup of your Production WordPress site. At the moment RunCloud can’t make backups on demand. The waiting period for a new backup to be created after configuration, is 1 hour. If you do not have an existing backup, you will need to configure one and wait an hour. Click on the name of your Web Application Backup to go to it’s settings. Click this icon to configure restoration parameters. From the Restore Backup settings, choose your Staging site web application inside the server you wish to restore to. 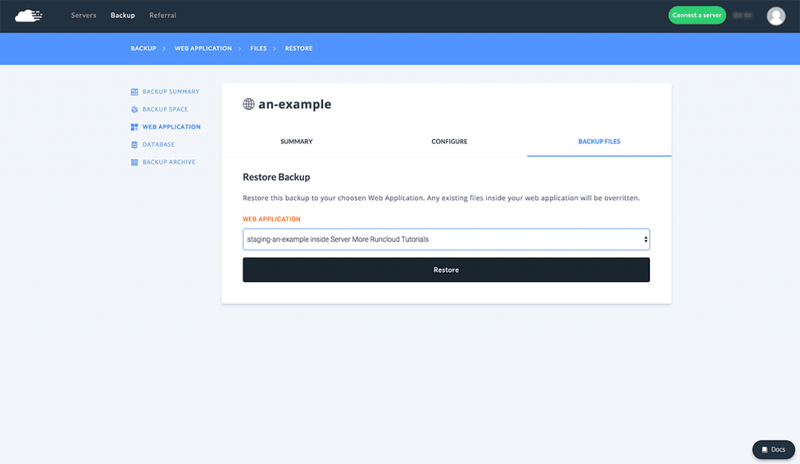 Choose to restore the backup to your Staging Site Web Application. The entire contents of your production site on one server, have now been copied into the staging site directory on another server. That includes the wp-config.php file, with the incorrect configuration parameters for the database and user. 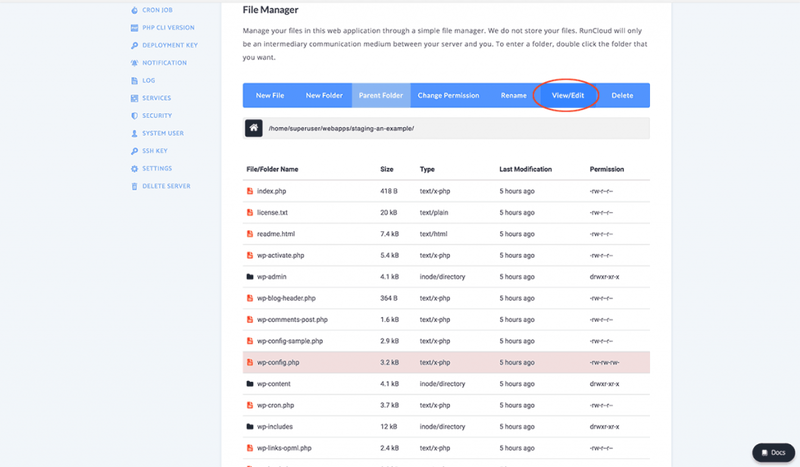 Click to edit the WordPress configuration file. In the RunCloud File Editor, enter your staging site database details. Press CTRL+S to save your changes. If you would prefer to fix the WordPress configuration file using the terminal, then WP-CLI is your friend. 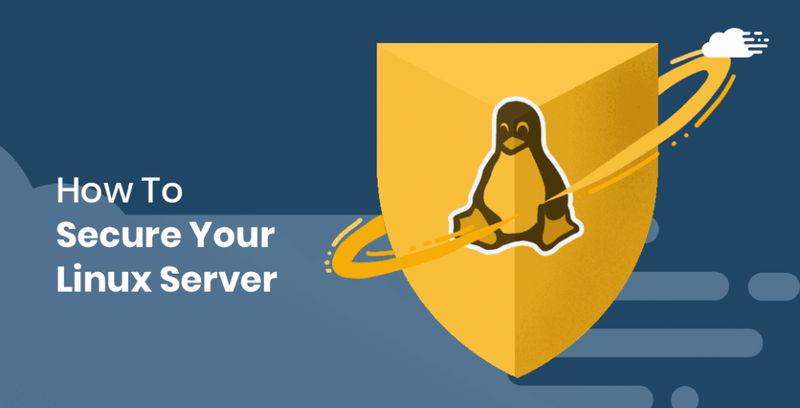 Connect to staging site server by ssh as your superuser, who should also be the web application owner. Change directory into the staging site root directory. Delete the existing WordPress configuration file, and create a new one using WP-CLI. Remember to replace the dbname, dbuser, and dbpass, with the name of the database, the database user, and the database password you created earlier. WP-CLI will output a success message once the new wp-config.php file has been created. Delete the original WordPress Configuration file and create a new one with WP-CLI. Whichever method you chose, your cloned WordPress directory structure and files are now ready to go. You will need to have an existing RunCloud Backup of your Production WordPress database. At the moment RunCloud can’t make backups on demand. The waiting period for a new backup to be created after configuration, is 1 hour. If you do not have an existing backup, you will need to configure one and wait an hour. Choose to restore the backup to your Staging Site Database. 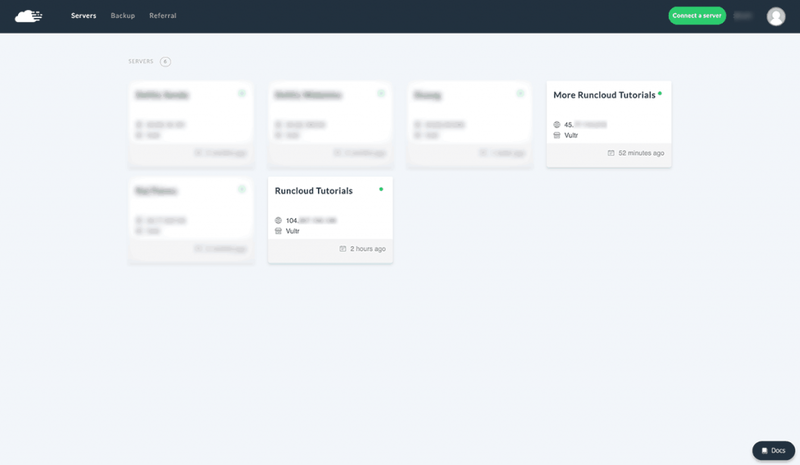 Our production database has now been cloned into the staging database. However we still need to update the database, to replace all entries of our production domain with our staging domain. No need to mention that there are several methods to do this (but I just did), as we are going to use the power of WP-CLI once again. WP-CLI wp search-replace is truly a thing of beauty. To be safe, since this is your database, you could issue this command with the –dry-run option first. This will display all the same information as if the search-replace had been issued, but will not execute the changes. At this point we have a staging site up and running. Nothing is stopping us from visiting it at our staging domain. However, let’s use WP-CLI to make a few more tweaks, just like last time. Use WP-CLI to update the site name and description. From within the staging site root domain, we can issue some wp option update commands to update the site title and description. As usual, each command will be greeted with a success message. Well, really we should incorporate our Staging site into a version controlled deployment workflow. We might even set up WP-CLI Aliased to be able to manage our Staging site from our local machine, as part of a remote management workflow. But that’s enough for now. 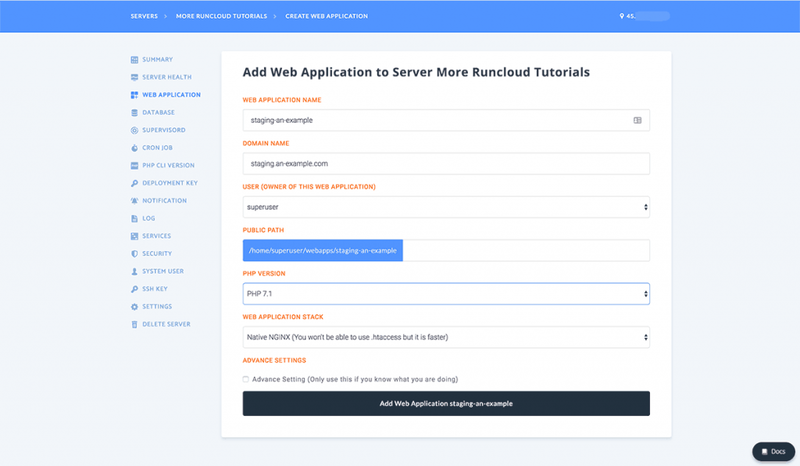 Simplify your server management with RunCloud. Try it out for FREE for 5 days. This would be a lot easier if there is an on-demand backup since. Last time I try using runcloud backup I needed to wait for atleast 2hrs to get a backup. I agree, The addition of on demand backup would make this less of a hassle. I raised this a feature request to make this a much more immediate process. I generally have backups running, but for those using alternative backup solutions this isn’t ideal. 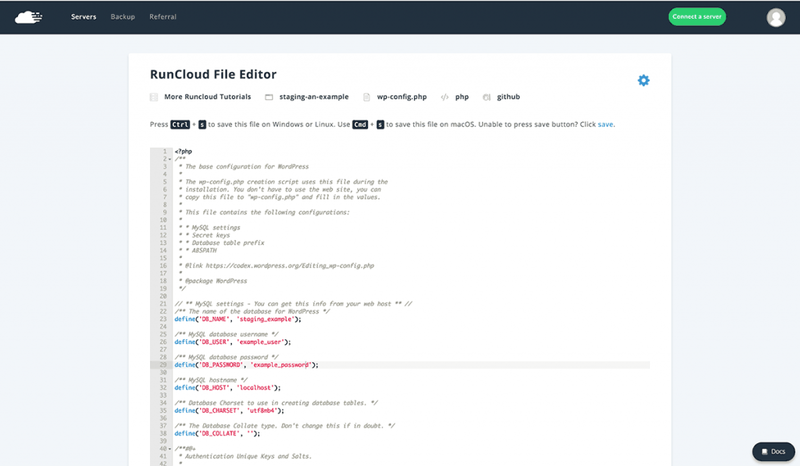 The RunCloud guys are good though, I am sure this will be coming once they have finished their work on the API. Weekly Quality Tips and How-Tos. Just For You. No spam, no nonsense, unsubscribe anytime.